AIPU Solids Control supply replace shaker screen for Derrick FLC 500 series shaker with flat and pyramid service for option. AIPU is one of the top supplier for various sizes shaker screen to replace as per buyer request. Derrick FLC 500 series shaker screen is one of the most popular sizes in the world, so many drilling contractors will require the replace shaker screen as per drilling conditions for good price and perfect screen performance. Screen dimension is 695*1253mm, each 695mm side installs a hook with rubber and handle. 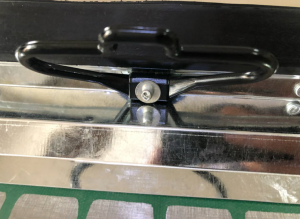 The rubber seal has good seal to avoid mud drops through gaps, the handle helps a lot for screen installation. 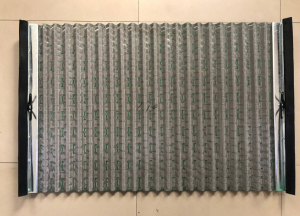 Screen API mesh can be from API 20 to API 400 to suit drilling site requirement to reach different mud flow capacity and solids size separation point. Screen surface can be flat or pyramid to reach different performance. Minimum order of shaker screen is 40 pcs, any order bellow 40 pcs should be special talk with us. Screen sample can be arranged to buyer quality check or jobsite test. Other than Replace Derrick FLC 500 series shaker screen, AIPU supply replace shaker screen for Derrick 2000 series, hyper pool screen, 600 series screen and other sizes screen. Please email us freely for replace shaker screen.